Companies in China involved in low value production and assembly are turning to Vietnam due to rising costs and increase in regulations. This strategy called “China plus one” has been implemented by several companies in the last few years. However, with growing trade issues between China and the US, the trend of shifting low cost manufacturing to Vietnam has recently picked up pace. Despite its advantages such as low manufacturing costs, overall proximity to China, and excellent network of trade agreements, Vietnam is not without its share of challenges. 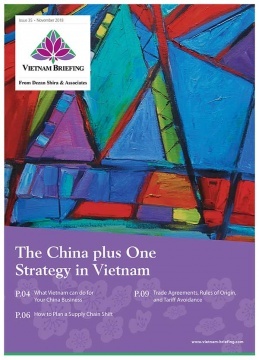 Manufactures need to figure out how to realign their supply chains, which production elements to relocate, market entry strategies, and understand the rules and regulations that governs Vietnam’s several trade agreements. Dezan Shira & Associates has a growing team of pre-market entry specialists throughout Vietnam, providing our clients with years of combined experience assisting foreign enterprises to navigate the nuances of the Vietnamese market and select optimal locations for investment. For questions on how to assess investment requirements, compare locations for establishment, and leveraging the rules of origin in Vietnam, please contact us at vietnam@dezshira.com.